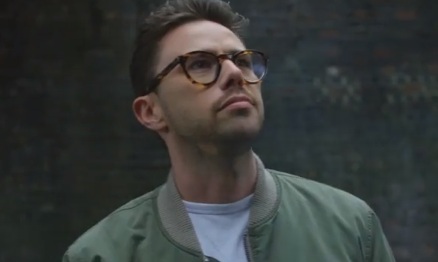 The London-headquartered high street fashion brand River Island invites you, in its latest advert, starring Associate Style Editor at Men’s Health, Matt Hambly, who is all about the classics, to find yourself. “There’s leaders and there’s followers. This season it’s all about taking the lead, interrupting the trends your way and breaking the style rules” – this is the message conveyed in the 10-second spot, featuring Hambly walking down a sidewalk and sporting timeless heroes, such as a green and beige bomber jacket (£60), made of woven fabric, with ribbed contrast trims, front flap pockets and bomber collar, a white roll sleeve T-shirt (£8 – but you can buy now two for £12), light blue sid ripped skinny jeans (£45), and navy dual color leather boat shoes (£45), with white rubber sole, leather lining, lace-up front and rounded apron toe. Asked what style means to him, he said that “fashion is about chasing the latest trends, but style is knowing what looks good on your and sticking to it. If you feel comfortable in what you’ve got on you won’t go wrong”. The advert, featuring the track “Peaky” by Bearcubs feat. Beau Young Prince, ends with the onscreen line “Find yourself at River Island” and with the hashtag #ImWearingRI.